and you whisper to your Jo San "Honey, I love you!" Then you're getting just a skoshi Nipponese! President Eisenhower initiated the People to People program to cause American military stationed on foreign soil to treat the people with dignity and respect. During the Vietnam conflict the Marines called the policy the People to Pieces program. The Okinawans complained that the Death Angel's attempted to blow them to pieces during Christmas 1966. The "Kill for Peace" motto of VMF(AW)-235 became obvious during the two months the squadron was out of Vietnam for FNG assignment and squadron ordnance training. The Death Angels spent several days at Iwakuni, Japan which is 50 kilometers south of Hiroshima. I recall jumping into a skoshi cab with Rocky Plant who was my fearless roommate. Rocky had been the All-Navy boxing champ as a young Marine and was still capable of handling huge crowds all by himself. Rocky promptly shouted to the driver, "Hi yaw ko, kuda sigh! Me takasan skivvie honcho! Nay!" The Japanese driver turned around facing Rocky and said. "Ah so! Mutha Flocka! You speaka Japanese too!" That 40 second ride seemed hairier than any previous kamikaze forays into the Ville! We debarked at the Club 500 where a dozen "buy me one drink" girls rushed forward to pamper us until our MPC was gone. A Jo San was heard saying to an inebriated Marine, "Boysan! Aw timey you speaka ruv! How can you speaka ruv when you hab no money?" 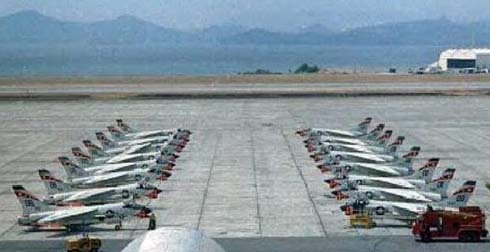 Fortunately for the Southern Honshu residents, the Death Angels deployed to Naha, Okinawa for weapons practice. Within days the squadron had angered the civilian population. Training included live sidewinder firing and our gunnery range was southeast. Sidewinders and flares were not considered dangerous to populated areas and flights turned directly toward the target area after takeoff. Unfortunately, we started losing flares. Seems the launchers were rigged improperly and the flares began dropping shortly after takeoff. The thatch roofed dwellings would burn to the ground in seconds. The 10 thousand-degree flares quickly ate through everything. It was especially spectacular at night! There was hell to pay over the flare fires. We had to change departure procedures and stay over water. Why weren't our allies worried about the Domino Theory? Sleep peacefully Okinawans! The Death Angels are awake! The incident that almost got the U.S. kicked off of Japanese territory was not the RASP incident at The Teahouse of the August Moon. That was bad enough! Demanding the bar girls stop drinking sugar water, dance for free, even pay for our drinks, and then chasing the Air Force and the locals out of the club. No, the international incident started on Christmas Day and lasted five days. The Death Angels were dropping live ordnance on Torii Shima, a small coral island 60 miles northwest of Naha. The weather had been gale winds, low ceilings, and cold rain for over a week. Being time limited for readiness, the squadron flew bombing and strafing missions day and night over the 1966 Christmas period. A large Japanese fishing vessel, the Takuyo Maru, became disoriented in the bad weather and high seas and struck the target island on Christmas Day. The boat broke up and the crew had to swim and claw their way ashore. Ten of the eleven crewmen survived. They were ecstatic hours later when red-nosed jets thundered low over the island. The crew members waved their shirts to attract attention. Moments later, the sailors were driven into the rocks and caves as bombs and rockets slammed into the island. Flights bombed the target all day. The island was quiet after dark. About 10 PM the sailors again heard jets. Soon, popping sounds came from above followed shortly thereafter by intensely bright lights. The sailors ran out in the open thinking a night rescue was occurring. The rattle of cannon fire was heard as grenade like 20 mm HEAP projectiles began detonating around them. The sailors scrambled back into the caves! The Battle of Torii Shima continued for four more days. The Japanese crew had given up on being rescued. They couldn't understand why the Americans were trying to kill them. They were mad as hornets in a damaged nest. The gale winds blew the Takuyo Maru wreckage twenty miles downwind onto an island where inhabitants found it on 29 December and notified Naha. SAR sent a Chinook Helicopter to Torii Shima to look for survivors. The helicopter landed when they spotted a survivor. The distrustful fishermen refused to leave their caves. They threw rocks and screamed insults. Finally, the American crewmembers approached the survivors and conveyed to them that the helicopter was for their rescue. Irate, and voicing their feelings, they reluctantly boarded the chopper. Upon arriving at Naha, the survivors saw the rows of red-nosed crusaders near the terminal and created another uproar. They shouted that the jets had deliberately bombed and strafed them more than a hundred times during the five-day ordeal. The Japanese said the Marine jets flew low over the target and upon seeing survivors, attempted to kill them. The pilots insisted that low level clearing passes were made across the target before commencing live runs. One Death Angel pilot reportedly said, "The best ordnance practice is live targets." Our BDA was nothing to brag about. However the whole exercise was a good drill for Vietnam trees in the open sorties against suspected targets.